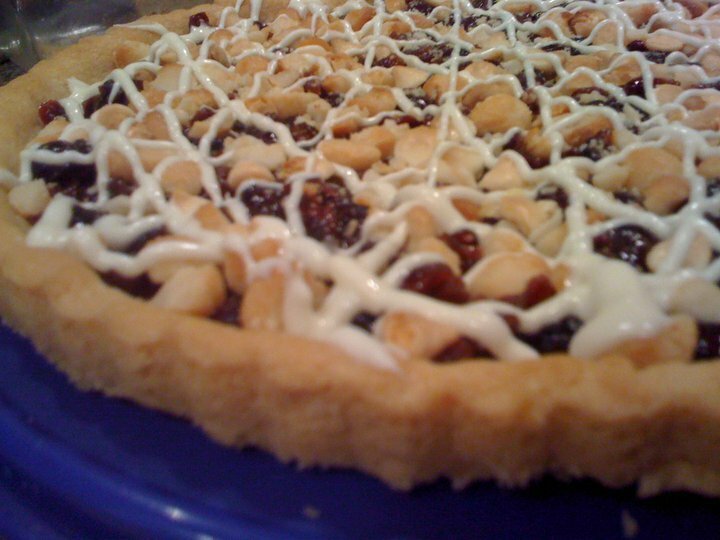 Sometimes the easiest desserts are the best desserts, and this recipe for Cranberry-macadamia bars that I turned into a dessert pizza is no joke! Changing it into a pizza was really quite simple. Prepare the sugar cookie dough as instructed. Instead of using a glass casserole dish, use a tart pan w/ a removeable bottom - I lightly sprayed the bottom pan, and then baked for about 10 minutes. In order to get the indention, I took a glass quiche dish and lightly pressed it into the par baked dough and then spread the cranberry mixture on it and then added the macadamia nuts and continued baking. A quick drizzle of melted white chocolate and dessert was done. Overall this was a quick dessert to make - I'm not too sure I like the pairing of the macadamia nut w/ the cranberries tho. If I were to pair any nut w/ the cranberries I would choose pecans, perhaps cashews but I didn't really think the macadamia nuts were the best choice.